I’ve reached the end of the time I’d allocated for Stage 6 – Prototype/maquette-making. In Stage 5, Sorting (28-Feb-2016) I set the goal of developing my collection and use groups of vessels in exploring space and presentation. This approach allowed me to keep sampling and exploring right to the end – which in effect makes “end” an inaccurate term. Rather than “ending” with Stage 7 Reflection, I really want to do another round of Sorting, and then some more Sampling. That’s what this course has been training me to do in my future practice, and fits so well with Ruth Hadlow’s model of practice as a series of strands of investigation, like currents in a river (25-Feb-2016). With on-going exploration / experimentation / sampling in each strand, a particular exhibition represents the state of investigation at that point. Rather than an exhibition I will be presenting the current state of my investigations as part of assessment. But I’m not finished! This post is to record some strands I want to return to, after all the business of writing up reflections, preparing my submission to tutor, then adjusting as advised for assessors. 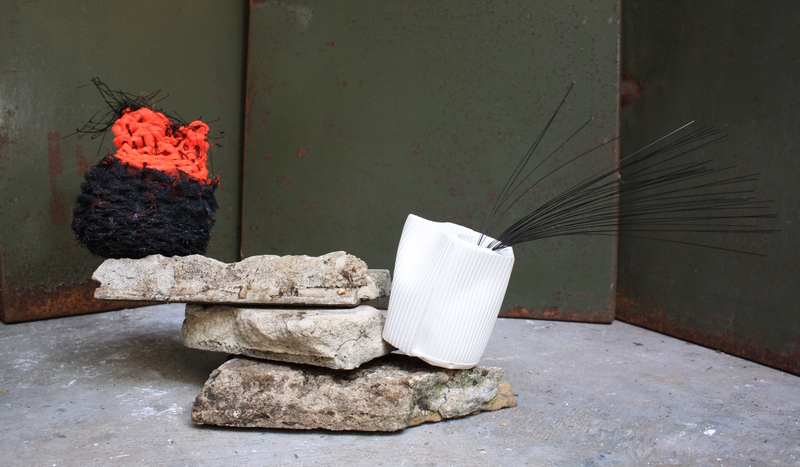 Vessels and material exploration: having learnt with Lissa de Sailles to make paper yarn (19-Mar-2016) I am very interested in the possibilities it brings, and started a little basket-based object using some of the plastic horsehair. There are connections to coursework in the plastic, the use of wrapping in the initial version (reminiscent of the wooden spoon shape! 16-Jul-2015), the use of basketmaking techniques seen in final samples (p5-5 31-Jan-2016 and p5-10 14-Feb-2016). The newspaper yarn brings something quite new. The look is so textile-like! I want to push the millimetre by millimetre deft wrist spinning technique with lots of different materials. So far it’s only been newspaper and copy paper (marketing from an insurance company). What about spinning a painting or drawing? Or… well not for this course. I’ve called it the final sample, but not allocated a number because really it’s the first sample of a whole new exploration. I’ve already mentioned that research on Eva Hesse is ongoing. It’s not ready for a neat post, so will miss being presented within this course. Related at least in part to that is other reading – Part Object Part Sculpture, edited by Helen Molesworth. I’ve been writing of my work as vessels and objects. What is sculpture, and is that where I’m headed? This week I saw a work that attempted sculpture using scent – I think. The artist, Dane Mitchell (http://www.danemitchell.co.nz/) participated in a panel discussion and described his work as showing “non-presence”. 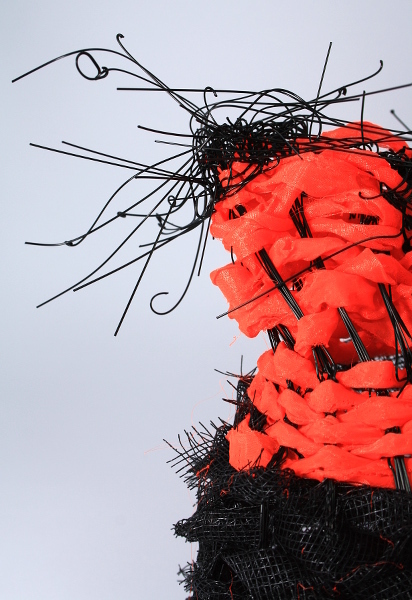 He explores the senses as a sculptural material, creating objects that take shape in the brain. He’s interested in making tangible, physical, aspects of the unseen. In a sense in the discussion Mitchell kept his scope contained, unlike the more grand responses to the theme Embassy of Spirits (this was all part of the Sydney Biennale). Is there something for me in this??? 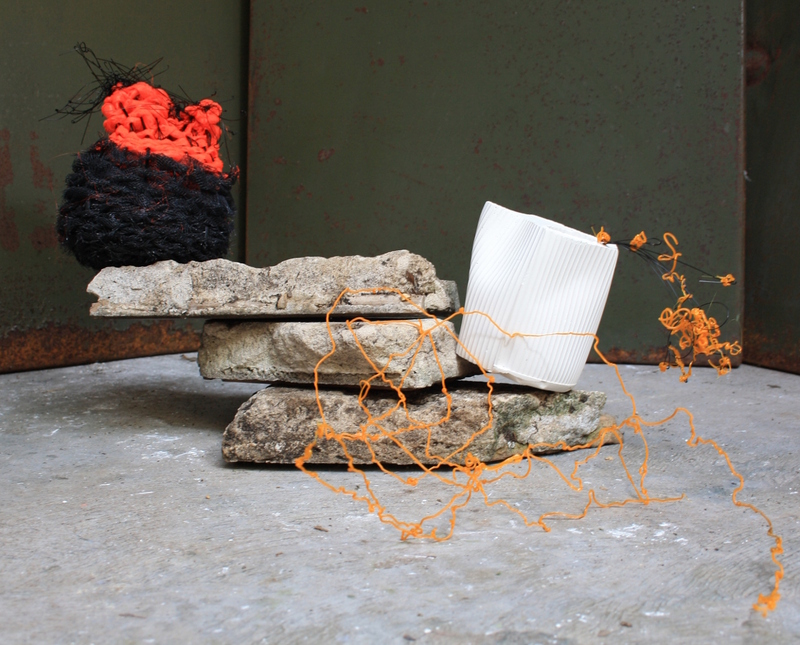 Other Biennale work was by Jumana Manna and involved film and sculpture (https://www.biennaleofsydney.com.au/20bos/artists/jumana-manna/). I’m hoping to find time to post some brief research on that within this course. My note here is on the combination of multiple media. My photography / video / lighting skills have not given the results I wanted in this part of the course. This is definitely an ongoing strand of learning and exploration. With that captured for the future, I now feel able to turn to the important business of reflecting on the recent past – Assignment 5, and Mixed Media for Textiles as a whole. I’ve written about Mugugalurgarra (conceal) by Jonathan Jones, one of the most powerful and meaningful uses of wrapping that I have ever seen (17-Mar-2016). A few days after the Canberra trip I was in the Art Gallery of NSW where installation of work by Sheila Hicks had begun in preparation for the Sydney Biennale. 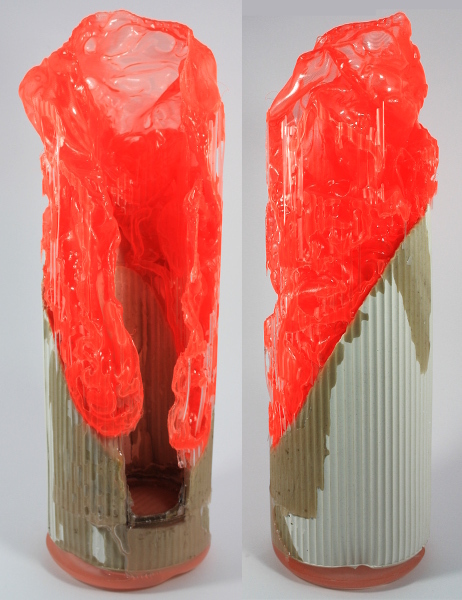 The work itself uses wrapping as a technique, but in these photographs the pieces have additional coverings of heavy plastic. Some appears to be related to transportation, but most was simply protecting the work overnight (I was in the gallery for an evening lecture). The wrapping mutes the bright colours, makes the shapes more anonymous, more uniform. Could I use that idea with my collection? I’ve written about the attraction / interest of repetition with slight variations, done a simulation (6-Mar-2016). 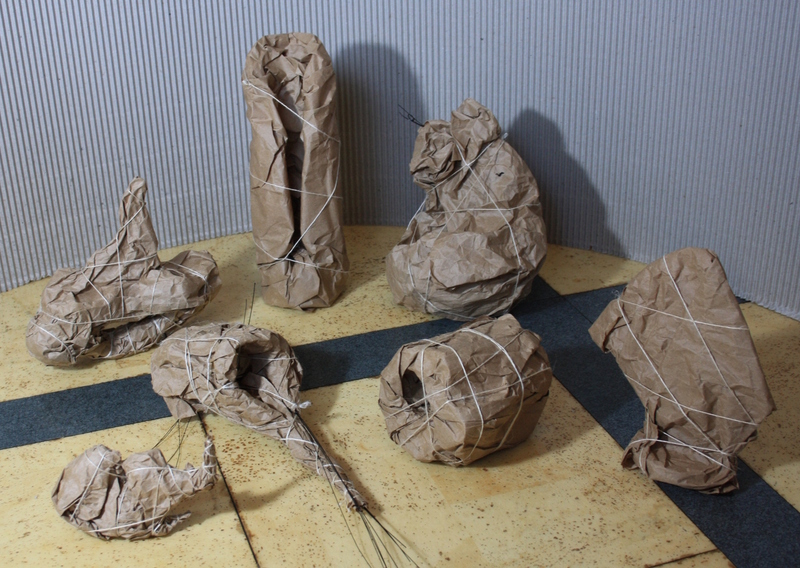 Could wrapping give an additional level of uniformity, a different way of seeing my objects? I sketched out the idea with a small collage. As well as providing a different perspective on the collection, I was really attracted to an idea that linked back so strongly to an earlier part of the course. It was interesting to see my own difference in approach. In the wrapping assignment I simply tried things, experimented. This time I had a goal – present these particular objects differently. It meant I had a purpose in auditioning and selecting materials. I started with the base assumption of heavy plastic, thinking back to work by Christo. It didn’t meet my objective of greater uniformity of objects in different materials and was quickly discarded. 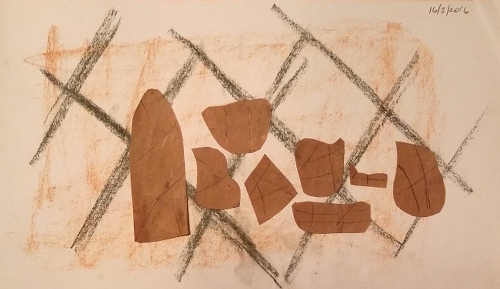 Given the material used in the earlier sketch / collage, I then turned to brown paper. Heavy paper lost a lot of detail of the forms, and I decided that I didn’t want the pieces to become too anonymous. A major point of the vessels was experimenting with space, the positive and negative spaces of the collection, and I didn’t want to lose that. Lighter weight paper could be crumpled (another nice echo from throughout the course), molded around the objects. For binding I chose a hairy linen thread, fairly fine. I liked the lines created in the wrapping – a good balance between distinct but not too intrusive and disrupting the semi-anonymity. I took 98 photographs and the one above is the best of the bunch. I do not find it interesting or exciting. Are the surrounds too busy? Is it lack of photography skills? Poor composition? The initial wrapping a bad idea? All these and more? I like the process from inspirations through to making. I just don’t know how to make the result interesting. At the end of the last post I had a plan. To keep myself on track I sketched out some do’s and don’ts. The next day I went out fresh, set up floor, background, concrete chunks, the best lighting I could manage, took breaks when indicated… Not easy. In the end I got two photographs which approach what I was looking for. The photo is a larger size than usual, so you can see the textures if you wish. I’m very happy with the mix of textures, the mix of materials. There’s asymmetry and I see the tilt of the plaster vessel first. It takes some time to see the slightly precarious situation of the other vessel. I was interested in coming right out of the picture towards the viewer, but I’m not convinced by this photo. To me it’s a positive that my eye doesn’t move around smoothly – that fits with the idea of teetering, off-balance. It would be better if the top slab was tilted, as if about to tip off to the left. There’s actually just of sliver of light visible, but too subtle. 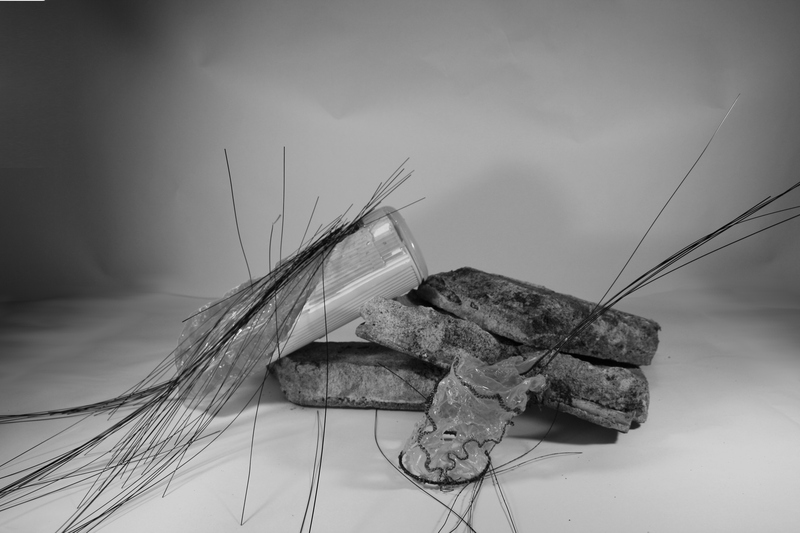 Next I went back to the concept of a pile of objects, experimenting with space. I am ambivalent about this video. Hopefully it gives an idea of the space created, the interaction of different pieces. I see more when I watch it again – for example in a section on glorious failure I see orange in the object, picked up from other pieces nearby. I think the environment and props enhance the collection. On the other hand the video itself is poor quality, the picture shaky, transitions clumsy (I pieced it together from a dozen shorter videos filmed). I believe it is as good as I could achieve with current expertise, my tablet, domestic lighting, and free software. This set of photographs was inspired by my research into Claire Falkenstein (11-Mar-2016). I started this Stage of the assignment using an unconventional background and looking to experiment with balance, based on my research on Gillian Lowndes (26-Feb-2016) and discussion in the workshop with Ruth Hadlow (25-Feb-2016). The video of “Claire Falkenstein: An Expansive Universe” (https://www.youtube.com/watch?v=mr0oUaBUkkA) made me think again about clean, uncluttered, white backgrounds putting all the focus on the works. That said, there are some major problems with the work shown below. I did it after seeing Claire Falkenstein’s work but before writing it up, so the photo-shoot didn’t take advantage of all the input from my research. It was also a very sunny, hot and humid day in Sydney and I got tired and careless carrying things from my work area in the house out to the garage where I did the photography. I knew I didn’t have a wide enough piece of paper on the tabletop and that the background paper was hanging badly, but I didn’t do anything about it. I’ve also gone for quantity rather than quality. The idea was to give myself options, to make some kind of break through, but attention and engagement was lacking. There are some positives. I found some thicker slabs to use as a base – cemented tiles from our crumbling front steps – and they provide interesting texture and good height. Working on a tabletop allowed me to photograph from a greater range of angles, including low and straight. I tried a few other specific ideas from the reflection on the first photo shoot (6-Mar-2016), including spacing in the groupings and trying to make more dynamic lines with the horsehair and 3D drawing. This includes an idea from earlier sampling and sketching, with some resin used to suggest fluid spilled from a fallen vessel. I don’t think the (relatively) clean background works with this idea. Also the whole photograph is stretched horizontally, giving a stability that fights with the idea of tipping over. Another element in the foreground might improve things. This photo has some elements of movement and there isn’t a lot of dead space. The resin shape almost looks as if it is pulling back after pushing the tall vessel over the cliff. The scattered black lines give a path into the image (no empty foreground). With those upright strands the tall vessel resembles an insect on its back, scrabbling to turn back over. Scaling of the photograph has resulted in some unpleasant stepping in the lines of some of the plastic horsehair, but a printout of a higher resolution version would address that. The change of sample on the right is not an improvement. It almost seems to have its back turned to all the excitment, and that single almost vertical hair has a quite disproportionate effect in stopping movement. Perhaps something playful would work here – I’d like to trying piling things up, have them cascading down. There’s a little bit of zig-zag going across the image. I decided to explore this a different way, desaturating the image and “tidying up” some of the distracting background. One difficulty with showing what’s happening is web delivery and managing file size. The thumbnail version to the left will open a large version of the photo, without those nasty judders from the scaling process. If you expand it to full size (probably bigger than your screen), you can see detail down to a few beads of resin on horsehair strands from the lower vessel, complete with matching bubbly shadow. I’ve printed this on A3 glossy photo paper and I think it makes an interesting image. I expected to really like the long diagonal through this photo, but it feels static. The same stack of concrete is getting tedious, but I like this image. The vessels look like a couple of tipsy party animals. The background paper is gathering creases and I prefer this – more interesting but not distracting. It’s slightly away from the centralised positioning which seems to be my default – need to watch for that. Having the lower vessel slightly obscured is more interesting. More interesting, or just that at least I’ve tried a different angle? The arch of black is effective and there is a sense of depth in the photograph. The background works for me. It’s fine – which is damning with faint praise. The black lines in this are great. The small vessel seems on its way out of frame. A lot of texture and different places to look. So many near misses. I like the hint of orange on the background paper – visible in some of the earlier photographs, but I only noticed with the tall vessel leaning in towards it. The blunt line of the tips of black in the foreground jerks my eye as I look around the image. I wish the foreground vessel was in better focus. The different lines don’t quite work together. The negative shape formed under the uppermost piece is interesting, but none of the samples are displayed to good effect here. Ho hum. Much, much worse. I was thinking of the interest of looking through things, as seen in the video of Claire Falkenstein’s work, but this is very bad. This isn’t as bad. Perhaps a V movement would be better, instead of this invitation to any viewer to tip their head to the right. The orange line reaching out of the image is great. I now have time and attention to see the vessel on the left, which displays quite well at this angle. There’s a sort of horizontal zigzag across the image. Altogether quite effective. The placement of the foreground vessel on the right is good and starts to make use of its central void. The whole thing seems a bit flat and low, and the orange line has lost some of its personality. This is fun and quirky. One of my favourites. There’s a bit of imbalance, a bit of crawling movement, a range of interesting shapes and space. I need to move that dratted concrete around more. This is another close-but-miss. In my next attempt I want to bring things together, fewer photos and learning from samples so far. The plan is to go back to the concrete floor and rusty shelving backdrop, but using the concreted tiles where I want to get height. I like the low viewpoint, which might take some flexibility and manoeuvering. I want to refine or develop some of the more successful compositions achieved so far. I also want to return my thinking to three dimensions, rather than just flattened photographs, so will attempt a video as well. That will be tomorrow morning all being well – another lesson learnt is to use times of lower temperature and higher energy. My last post ended “I’m looking forward to seeing what happens next” (28-Feb-2016). True, but not complete. I’ve been writing and thinking about this Stage so much now it comes to doing I’m a bit daunted. Still, the structure remains – research, sample, record, sort. I don’t have a predetermined result, I’m working in a terrain of uncertainty. I’ve got what I said I wanted. There’s a lot of cross-connecting going on between research, sketchbook, general thinking, and initial sample-making. This post is going to outline progress to date, with some detail included in later posts. It’s a jumble – welcome to transparency and the inside of my head. Research has started with Eva Hesse. That’s ongoing. The critical thing at the moment is seen in the sketchbook. Hesse made serial art, deliberately using a form repetitively with some kind of progression or permutation. Above is my sketch and a photo of Hesse’s sketch for Repetition Nineteen. There are nineteen vessels, similar but not identical, which could be arranged on the floor. Brigitte Kölle writes “Paradoxically, it is precisely this principle of ‘similar-yet-different’ that intensifies the impression of the repetitive. And it is the repetitive character that emphasizes the small variations and alternations that much more clearly” (Kölle et al, pp 31-35). It brings a sense of temporal duration, and can cause unease in being regular yet not. Reading Kölle took me on to George Kubler and a “history of things”, “reunit[ing] ideas and objects under the rubric of visual forms” (as compared to ugly ‘material culture’) (Kubler, p. 9). I wonder about the “usefulness” of my sample vessels, in what I understand of Kubler’s sense that all made objects must be useful in order to be made. Plus there’s the attraction of the power and the theoretical underpinning of repetition. Have I chosen a less satisfying path? I used gimp to create copies and small variations of sample p5-11, to simulate a possible series. I can imagine that path as enjoyable and with attractive results. But I don’t see it as very risky. A recent thread on the OCA student forum led me to a TED talk by Luke Syson (Link). The “useless” vessel that Syson discusses has nothing in common with my explorations, until he makes a link with the fantasy of London’s skyline. An element of fantasy and imagination – I’d like to think that my pieces exhibit some of that. Variety rather than repetition can make its own impact. Following up an earlier idea, and wanting to explore and celebrate some of my fantasy shapes, I used the 3D pen to “sketch” sample p5-7. As in previous use of this pen, it really had me focusing in on the shape of the sample. The end result is a series of interesting shapes, which may be useful in later compositions. Sample p5-10 (14-Feb-2016) surprised me with distortions in the plastic horsehair when heated. I decided to try the 3D pen as the source of heat, and ended with some little fantasy flowers. These make me smile. Using one of my vessels as a normal vessel – a vase! Outlandish. 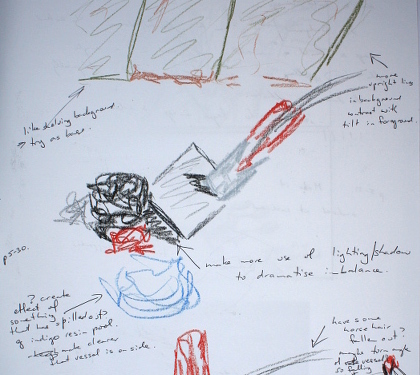 Sketchbook work included some ideas for composition (rather literal and drab), plus a potential knot of corrugated plaster and/or resin which I think would be really interesting but not on topic for the current stage. Finally I decided to simply start experimenting – find an interesting spot, put together some groupings, record. No pressure at this point, just seeing what happens. There’s a lot of photos here – in fact this could be my series of small variations. I’m going to number and show each variant attempted, with some later sketching thinking about potential further steps. This set was taken on the concrete floor of the garage, with natural light from the doorway. There’s some distracting background in the beginning. After a while I found some rusty metal shelves to provide a background. Although a couple of samples are balanced at an angle the overall effect is very static. The eye simply moves in a circles around the central part of the image. Possibly taking the photo from a lower vantage point would help. No positives here. Cropping adds impact beyond simply getting rid of a distracting background. There’s a bit more movement. Although the tiles create differences in height it is not apparent. A change of viewing angle would help. More chunky layers are called for. Again angle and thickness of layers would improve the result. More exaggeration in tilting of samples should be attempted. Static, however I like the slight reflection of red/orange that can be seen in the glossy black of the lower sample. There are some interesting lines in the horsehair plastic in this photo, but the overall arrangement is bland and the background distracting – although I like the orange of the wheelbarrow. Perhaps that could turn into a prop in some way. How far can I push the tilt of the different samples? This is the first photo with the rusty shelving background. I like the texture. The addition of an isolated element works quite well, making my eye move back and forward, breaking up that tight circle. There’s some interesting negative space beginning to develop. Back in a tight circle. I need to avoid this. Not the feeling I’m looking for, but I like this photograph. There’s some good depth and a swirl beginning to happen. The resin sample in the middle provides stability – which I definitely don’t want. The sample on the left really seems to be sliding away, which is the precarious movement / moment that I’m looking for. I have some plaster shards that could be added to enhance a sense of danger. Cropped out of the sketch is the idea of breaking one of the samples. That will have to wait for later in the process, given it removes as well as adds options. Changing the resin sample and its placement is an improvement, but it’s not exciting. The sample on the left hangs well over the edge of the tile, but it can’t be seen. As already noted, I need to work on the layering material and the viewing point of photographs. I probably also need to be braver about placement of samples, or else introduce some discrete safety measures. The resin sample doesn’t have huge impact, but I like the see-saw effect that is suggested. The roughly vertical lines of the shelving in the background accentuates tilt – I should take more advantage of that. I think this is worth developing. Better lighting to emphasize voids would be good. The background shelving curves down on the right and I think that reduces the effect of tilt in the sample. Perhaps I can add something that appears to have poured out of a tilted/fallen sample. A close-cropped version doesn’t really help. All of these photos were taken with me sitting on the garage floor along with the samples – clearly an issue. I like the stretch of the sample on the left. Perhaps with lighting or angle I could make more of that. Exaggeration of slide and angles is called for. There must be ways I can use plastic horsehair or something else to create additional movement and interest. Not what I want, but I like this grouping of samples. The rusty shelves provide a good background – I want to work with these more. The tall p5-12, although not considered a strong piece on its own, proved very useful in group combinations. I didn’t have my full set of objects with me, so will need to make sure I have all options available at the next shoot. Angle of viewing is important. I need an alternative to the tiles to create different heights and angles.